Planes, Trains, and Automobiles! 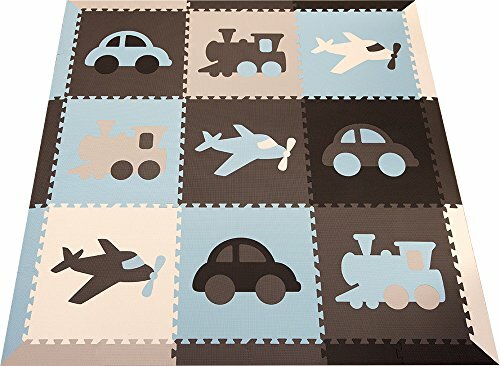 This SoftTiles Transportation Theme children's play mat in Black, Gray, White, Light Blue, Light Gray features planes, trains, and automobiles is a unique color scheme for a playroom. The shapes in this foam play mat are very large. The foam tiles are die-cut from our large SoftTiles 2 foot x 2 foot interlocking foam tiles. This play mat measures 6.5 x 6.5 feet (78 x 78 inches)- an area over 42 sqft. This is a nice sized play area for infants learning to crawl and toddlers starting to walk. In this foam tile set, you will receive 9 SoftTiles with die-cut shapes and 24 borders. The sloped borders are unique to SoftTiles and help provide a smooth transition from the mat to the floor. It helps prevent tripping and looks great at the same time. SoftTiles are made in Taiwan from EVA foam and tested free of formamides, BPA, phthalates. Because the Safari Animals foam mats are die-cut with a few smaller pieces, WE DO NOT RECOMMEND them for use on soft surfaces like carpet as the pieces can pop up when walked on. SoftTiles has been creating designer foam mats for kids since 1994. We saw the need for fun designs and colors beyond the plain alphabet set in primary colors. If you want a distinctive play mat for your child's playroom, then this mat is for you! Other SoftTiles Designs on Amazon include: Safari Animals, Nautical Theme, Sea Animals, Dinosaurs, Flowers, Butterflies, and Circles. DESIGNER: Designer color palette that will be the perfect play mat for any living room, playroom, or nursery. SOFT: SoftTiles playmats turn hard wood floors and concrete basements into fun playrooms. SoftTiles create soft cushioned surfaces that are perfect for infants and toddlers. SAFE: SoftTiles are created for kids and have no small pieces! SoftTiles are Non-toxic Foam Mats and do not contain formamides, BPA, phthalates. We have been selling foam mats since 1994- children have grown up on SoftTiles! HIGH QUALITY: SoftTiles are high quality mats that are 5/8" thick (14mm). Thicker mats interlock better and are less likely to come apart. SoftTiles are designed to look great and last. SLOPED BORDERS: SoftTiles uses specially designed sloped borders to help prevent tripping when entering and exiting the play mat.